Mifflin-St Jeor Equation(calories/day): (Your resting metabolic rate) Male: 9.99 x weight + 6.25 x height – 4.92 x age + 5 Female: 9.99 x weight + 6.25 x height – 4.92 x age – 161 weight in kilograms, height in centimeters, age in years This equation paired with the activity multiplier can give you an idea of where you are at. The most common place I would go to is Life Time Fitness for a more accurate assessment. They have all of the New Leaf Fitness equipment to perform a metabolic test which generally is inexpensive compared to getting it done through certain doctor’s offices. (If they even have the equipment) Most of the time, the results from the test can even be input into some heart rate monitors for a more accurate calorie burn when you train. Again, all tests have some margin of error, but it’s still important to try and find out your own personal numbers so you don’t have to guess as much with your nutrition. Make an appoinment with Katrin Gebhard at Lifetime Fitness John’s Creek. She’ll take care of you. If you’re smart enough with your food & have an idea of what calories you consume in the first place, finding out your metabolic rate may not even be needed. You could make minor changes to the way you eat and start seeing results immediately. For others, this may involve more work to see changes. Every person is built uniquely. Sometimes another person may require more tests to solve a health problem. Other times, you start adding extra fruit, vegetables, proteins and the health issue is gone. What gets measured, gets improved! Track what you eat and how you train. See what you’re eating now, compared to what your estimated metabolic rate is. You can use those variables to see how accurate the measurement is for you, and the changes you need to make from there. 4,491 sure is a lot of calories! On this day, I had 2 good sized workouts. It was 90 minutes of back in the a.m., followed by 90 minutes of legs in the p.m. If you train more, you need to eat more! After using this equation, and / or getting a metabolic test to determine a caloric goal to shoot for, experiment with various healthy food pairings. 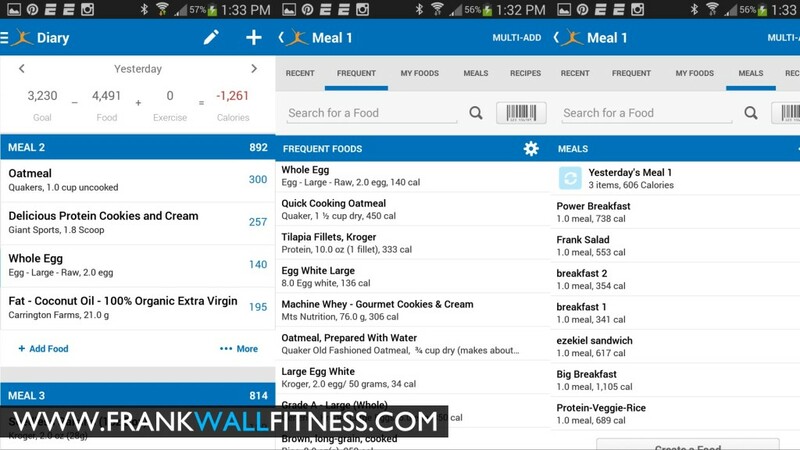 Use helpful apps such as My Fitness Pal to track your food. It makes it easier for a coach or friend to see what you ate for food, and if any changes need to be made Also, be sure you actively participate in some sort of exercise program as this helps you achieve your goal of burning fat and building lean muscle. See what exercises suit your body, and how do you feel training based on what you are eating. Take pictures to note your progress. Without them, you will not know how much you’ve changed. If you need help with creating your workouts, I can perform various exercise assessments with you to create a plan based on your body type, how you move, and level of exercise knowledge. For creating your new habits, eat what you feel is a sensible healthy breakfast, lunch, and dinner. Add in a few snacks if need be. Consume what you think is “plenty of water”. If you have no clue on how much water you are supposed to be drinking, make sure you read my blog on Hydration. Portion out all of your food. Measure and journal everything. See what a workout day looks like and also a non-workout day. Once you have this information, then you can start slowly adding, subtracting, or swapping things from your list as need be. Always check with your doctor first. Get blood work done regularly so you can make sure your hormones are in balance. If anything is off, this can play a critical role in what and how much you eat. Bring this information to your nutrition coach / dietitian and discuss your exercise routines, habits, and the way your body looks / feels. Follow some sort of scheduled eating intervals and routine exercise regimens. If you see positive changes, great, keep going! If not, contact me and let’s see where your body is at and if you are eating enough calories. What is your goal? Is how you’re eating now working towards the desired look of your body? 1. Erin Coleman, R.D., L.D. Minimum Amount of Calories Needed Per Day to Survive. Jan. 2014. Web. 2 April. 2015. 2. Mark P. Kelly, Ph.D. Resting Metabolic Rate: Best Ways to Measure It—And Raise It, Too. Oct. 2012. Web 21 April. 2015 3. Dr. Tyrone A. Holmes, Ph.D. Losing Weight with Basic Metabolic Rate: The Mifflin-St Jeor Method.